There so many fragrances in the world today, that it is quiet difficult to find your favorite smell. Still, with a lot of tries I cannot imagine my day without Carolina Herrera CH. A day without my beloved perfume is as if a day without my ‘second skin’. I think that everyone will agree with me that a fragrance is an invisible aura, an accessory that can change our mood and feelings. Undoubtedly, there are people in the world that do not use any perfume or cologne. It is because there are people who emanate their individual body smell that is more attractive and alluring then any other fragrances in the world. However, Carolina Herrera Perfume is fresh, elegant yet modern fragrance. Main notes include bergamot, melon, orange, jasmine, cinnamon, and other notes that express the contemporary fashion design. 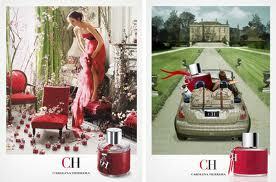 CH fragrance comes in a chic cylindrical bottle wrapped in red leather, as if a woman radiating LOVE. Every drop of this perfume takes my mind to a dreamland that I create myself. It is a year-around popular fragrance, and a must have perfume in a women’s collection. Carolina Herrera top notes increases and tantalizes a woman’s mind, with heart notes calming the scent and relaxing on the skin. Believe in the secrets of your heart, and experience the power of Carolina Herrera CH Fragrance to make your dreams come true.